Yesterday I spent a great deal of time making a flower crown, and I’ll be honest with you it wasn’t as easy as it seemed. The final time it took to make the crown was about 2 and half hours, but I got all my materials from the Dollar Tree, so that could be why. I saw these crowns come into style from Lana Del Rey, who I have ambivalent feelings for and didn’t love love love these at first. I have always been more of a dandelion flower girl. Furthermore, I think Lana is stunning, she has a vintage look to her but I am not sure how much I like her style minus the crowns. I think her H&M ads are gorgeous and she has fabulous hair and makeup taste but still I’m not exactly sure if I like her. Her music makes me feel strange. 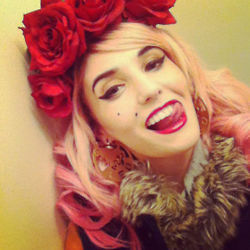 Moving, on I LOVELOVELOVE Audrey Kitching. I would do anything for her, and when she posted the picture of her in this crown last May I couldn’t wait to post it on my blog. I liked the crown but not enough to start searching. I haven’t quite experimented on the prices of these crowns because I was so quick to make one, but I’m excited to make a second one with better quality flowers! The instructions above seem pretty simple compared to what I did, which isn’t even worth blogging. I hope y’all try this!